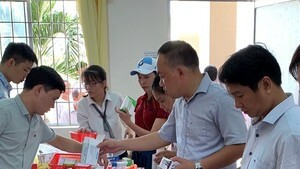 The Vietnam Food Administration, under the Ministry of Health, said it will set up 8 inspection teams to examine the compliance with food safety and hygiene regulations in 24 provinces and cities. The inspection will be carried out from January 10 to February, 2013, which corresponds to the Tet, or lunar New Year, holiday. The teams will conduct inspections at a number of producers, processors, traders, and importers of food, especially widely consumed items during Tet such as cakes, candies, confectionery, cattle and poultry meat, pork pies, and sausage. The inspection will focus on the origin, quality, trademarks, and safe and hygiene conditions of the products at big producers, processors, traders, and importers of food, whole sale markets and trading centers. Food items of poor quality or without origin will be banned from entering the markets and strictly punish violators. According to related agencies, consumption of food increase drastically in the end of year and during Tet holidays meanwhile there is a lax behavior on food safety control. In Hanoi, animal meat quarantine tests account for 60 percent. Around 27 percent of animal meat in the country is tested about its origin and 73 percent consumed in markets is not tested of quality and food safety. Inspectors from the Ministry of Culture, Sports and Tourism said to increase management on civilization lifestyle in organizing festivals, the ministry will send 6 inspection teams to provinces that trouble – spot took place in previous years. Following, from January 16 – 29 three mission team led by deputy ministers will inspect the preparation of festivals at Tran Temple, Day Palace, Yen Tu Mountain, Keo Pagoda, Huong Pagoda and Ba Chua Kho Temple. Tran Temple Festival held in the northern province of Nam Dinh when dozens fainted after jostling and elbowing one another to lay their hands on a lucky talisman being sold there. The second inspection will be conducted after Tet holidays. Culture Chief Inspector Vu Xuan Thanh said mission teams will address and prevent violations in festive organization and preparation in a bid to orient cultural activities in right way and contribute to develop human value of festivals in improve spiritual life of people. Since January 1, the government’s decree on production and trade of alcohol will take effect. The decree regulates that organizations and individuals to make wine with hand-made methodologies must have business certificate, their products have labels. Individuals making wine to sell to legal enterprises should register to the commune people’s committees and they should show the contract with enterprises to authorities when being inspected. By statistic of the Vietnam Food Administration, the country has 20,000 wine makers yet only 10 percent of them announced quality standards. These wines have no quality standards including countryside wine, traditional wine, medicinal wine containing high content of toxic substance such as aldehyde, methanol. Every year, the country has 800 million liter of wine in market including industrial wine accounting for 20 percent and the rest making at households which is difficult for checking the quality and procedures. The surprise figures show toxic wine victim accounts for 26 deaths and it is on the increasing trend. During five last years ( 2007-2012), the country has 36 wine poison cases causing 250 people hospitalized and 66 fatalities.